Did you know "Autism affects about 1 in every 110 American children, a 57 percent increase over the last estimate in 2002," says the U.S. Centers for Disease Control and Prevention. An estimated 1.5 million individuals in the U.S. and tens of millions worldwide are affected by autism and treatment for autism is a very intensive, comprehensive undertaking that involves the child's entire family and a team of professionals. Autism.lovetoknow.com says, "Outdoor play, targeted to address motor skills goals, can be a great tool for the reinforcement of the work done in physical therapy sessions. Toys that encourage climbing, such as jungle gyms or slides, can provide great gross motor reinforcement, as can outdoor play equipment that encourages jumping, like trampolines. Playing catch or Frisbee can enhance eye-hand coordination, and tunnels that encourage crawling can support the development muscle strength and general coordination." I recently discovered an awesome book --Fifteen Minutes Outside: 365 Ways to Get Out of the House and Connect with Your Kids (read my review here) Although it's not specifically for autistic children, this book is the perfect resource for any parent who just wants to get out there and nurture their kids with a little nature. Author Rebecca Cohen lays out a great plan with an idea for every day of the year. What makes this book great is that each way to get outside is a low to no-cost idea that anybody can do. And each one is tested by the author herself, who made a New Year's resolution to get out of the house every day and bring her two sons with her. Giveaway Details: Enter to win this book! **UPDATE: This giveaway has ended. Congratulations to helperSarah and a big thanks to everyone who entered! To enter giveaway, please follow this blog and leave a comment below. Giveaway closes at midnight on Thursday, April 14th and is available to US and Canada Only. Good luck and don't forget to visit the blogs listed below for more great giveaways! This is such a good giveaway hop. I love the awareness it's creating. Thank you for participating. 15 Minutes Outside looks like such a great book! Thanks for the chance to win. I have this book on my wishlist. It looks awesome, because who doesn`t have a meager 15 min to get outside. Thanks for supporting such a wonderful cause and for sharing this book with us. I would love to own a copy! I have a confirmed email subscription to The Book Bugz and/ or Lori's Newsletter. i am following you on gfc - ramblings of a part time druid. and i would love a chance to win this book so i can give it to my cousin who works a lot and is always trying to spend time with her 2 kids. Thanks for hosting and spreading awareness. 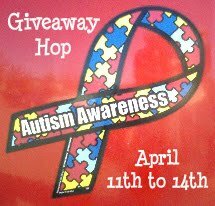 Thanks for spreading awareness of autism and for the great giveaway! gfc follower. sounds like a very useful book. i have cousins with autism. Want to learn where recyclables go?